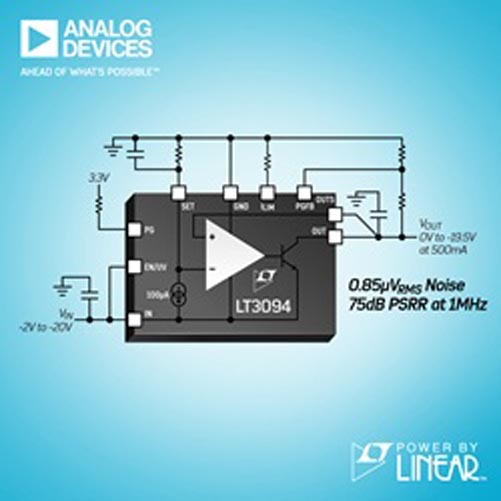 Analog Devices announces the Power by Linear™ LT3094, an ultralow noise, ultrahigh power supply ripple rejection (PSRR), low dropout voltage, 500 mA negative linear regulator that targets applications requiring the lowest noise performance. It features industry-leading 0.8 µVRMS integrated output noise (10 Hz to 100 kHz), providing the quietest environment for precision measurements of low level signals. The LT3094 features very low 2 nV/√Hz spot noise (at 10 kHz), minimizing phase noise when powering sensitive communications circuitry. PSRR performance is exceptional over a wide frequency range: low frequency PSRR exceeds 100 dB out to nearly 4 kHz and high frequency PSRR exceeds 70 dB at 2 MHz. The LT3094’s high PSRR greatly reduces ripple and noise when used as a post regulator for switching power supplies. The LT3094 utilizes a proprietary LDO architecture – its precision current source reference followed by a high-performance unity gain buffer results in virtually constant noise, PSRR and load regulation performance, independent of output voltage. This architecture permits easy paralleling of multiple LT3094s to further increase output current, spread heat on a printed circuit board and decrease output noise. In addition, it allows the output voltage to be programmed down to 0 V.
Delivering up to 500 mA output current, the LT3094 has a low 235 mV typical dropout voltage at full load. It features a –2 V to –20 V input voltage range and a 0 V to –19.5 V output voltage range with ±2% tolerance over line, load and temperature. The device’s wide input and output voltage ranges, high PSRR and ultralow noise performance are ideal for powering noise-sensitive applications such as LNA power, very low noise instrumentation, high speed/high precision data converters, power medical applications such as imaging and diagnostics, RF switch negative supplies, PA biasing, precision power supplies and as a post regulator for switching power supplies. Power Supply Ripple Rejection vs. Frequency. The LT3094 is a complementary negative version of the 20 V, 500 mA, 0.8 µVRMS LT3045 ultralow noise LDO and the two devices when used together combine for an ultralow noise bipolar power supply solution. The LT3094 is available in thermally enhanced 12-lead 3 mm × 3 mm DFN and MSOP packages, both with a compact footprint. The E- and I-grade versions are available from stock with an operating junction temperature of –40 °C to 125 °C. A future high temperature H-grade version will be rated from –40 °C to 150 °C.